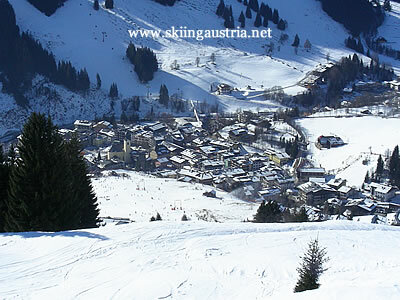 Saalbach has a good claim to be the best ski resort in Salzburg. While the famous resorts in the Tyrol to the west tend to get the column inches in the newspapers and magazines, the ski area above the village deserves to be ranked in the Austrian top 10. While Saalbach and its smaller neighbour Hinterglemm don't have the upper-crust attractions of a Kitzbühel or a Lech or the notoriety of the party resorts like Sölden and Ischgl, the Glemm valley can boast an attractive blend of lively village charm, combined with a ski area that can match many of its western neighbours. Saalbach has its own group of regular visitors - skiers who will wax lyrical about the traditional mountain huts or the après ski possibilities coming off the slopes at the end of the day. But for some reason, it has always seemed to play second fiddle to the nearby centre of Zell am See, even though the ski area is far bigger, the villages are higher and the mountain setting is just as attractive. Rumours continue to abound about a further extension of the ski area, despite the recent link up to Fieberbrunn - a link to Zell am See in one direction is going through the discussions at a local government level and a game-changer would be, eventually, creating a massive ski area via a link into the Kitzbühel valley. Saalbach is the principal village covered here but skiers can also choose from Hinterglemm up the valley, Vorderglemm down the valley or Leogang over the other side of the Asitz mountain. (See the Hotels and Travel tabs above for details about booking your own accommodation and making your own way to the resort). Location: Saalbach is situated in the Glemm valley in between the towns of Zell am See and Saalfelden and not too far from Salzburg. Access: The village can be reached by bus from the main valley, which is also where the nearest train station is located. Saalbach's ski area consists of long runs on both sides of dead-end valley with a link over to Leogang in the next valley over. Both Saalbach and Hinterglemm cross over from one side to another, but many visitors like to ski the valley circuit in one direction or another, or else to take a day excursion over to the Leogang side. The skiing is mainly at an intermediate level and a feature of the area is that many of the connections involve skiing from the top stations of the lifts to the valley floor. Those who enjoy getting plenty of kilometres under their skis will relish this style of skiing, but it does mean that it is necessary to descend into mushy snow in poor conditions. What is especially unusual about many of these long runs is that they are blue runs, meaning that skiers at a lower intermediate level or those who are a little nervous about getting stuck on something too hard have an opportunity here to stretch their legs and really cover some ground. The runs from the Schattberg down to Vorderglemm and the one from the Seidl Alm down to Viehhofen are examples of this type of run.Intermediate level skiers who are a little bit more confident will find that this ski area is perfect for them, with those long blue runs augmented by a collection of interesting reds dotted all over the various mountains. Those who are looking for something a little bit more testing will find some easyish black runs off the Zwölferkogel in the Hinterglemm area as well as the run directly down from the Schattberg into Saalbach. One last plus point that Saalbach skiing offers is a high number of traditional-style mountain huts for stops along the way and a party atmosphere in the some of the lower ones at the end of the day. A day pass for the Saalbach ski area will cost 55 Euros and a six-day pass will cost 263 Euros. There are reductions for the pre-Christmas period, in January and from mid-March. Saalbach is not bad for beginner skiers. The slopes to the north of village offer a practice area for those just learning, while up on the Kohlmaiskopf and Bründlkopf there are networks of undemanding blue runs. Saalbach is a deserved favourite of intermediate skiers. The loop around the end of the valley at Hinterglemm or the run over to Leogang are examples of the many options available. Saalbach is a decent-sized village with most of the accommodation nestling in a central area between the main road up the valley and the ski slopes. Some other establishments are dotted along that road a little bit away from the centre but able to access it easily by the regular ski bus up and down to the various lifts. Down the valley there is a smaller village of Vorderglemm with its own lift access to the area, while up the valley lies Hinterglemm, an equal partner in the valley skiing with its own great selection of lifts and accommodation. Previously Hinterglemm was thought of as quieter and a little bit more exclusive but these days there is not a great deal of difference between the two. The search box to the right (or below if you are using a smartphone) gives an availability check for particular dates for all of the accommodation in Saalbach. Salzburg is the closest of the principal airports used for winter holidays in Austria and offers a good range of charter and scheduled flights. Public transport is best by bus, with a service going from the airport through to Maishofen and another connecting route then heading up the Glemm valley. Innsbruck and Munich are both considerably less convenient for those arriving by air and relying on public transport. There is a train service from Innsbruck's main station through to Saalfelden (passing through Leogang, which is also connected to the Saalbach ski area) or to Zell am See but nonetheless the journey is likely to take two or three changes. Likewise transport from Munich is likely to involve at least three changes and take around five hours. Car drivers arriving from Salzburg and the east should head over the German border past the airport in the direction of Unken and the town of Lofer. From here a main road leads south to Saalfelden and Maishofen before heading into the Glemm valley. Drivers coming from Germany have a few options - all of which should end up at Saalfelden eventually. Drivers can come off the motorway at Oberaudorf (then via Kössen and Lofer), at Kufstein or at Wörgl (then via St Johann and Leogang). Those arriving from Innsbruck and the west will be taking the Inn valley motorway through to Wörgl and then the route mentioned in the previous paragraph.